​​​​​U.S. - Rent growth accelerated in 3Q 2015, as the average gross asking rent rose by 4.8 percent, year over year, to a new high of $29.36 per sf according to CBRE’s latest U.S. Office OccupierView report. Downtown average asking rents — having surpassed their 2008 peak in 1Q 2005 — continued their steady increase, setting a new historical high of $43.44 in 3Q 2015. Suburban rents have picked up pace but have yet to reach their previous peak, as the 3Q 2015 average of $23.66 is still below 2008 levels. 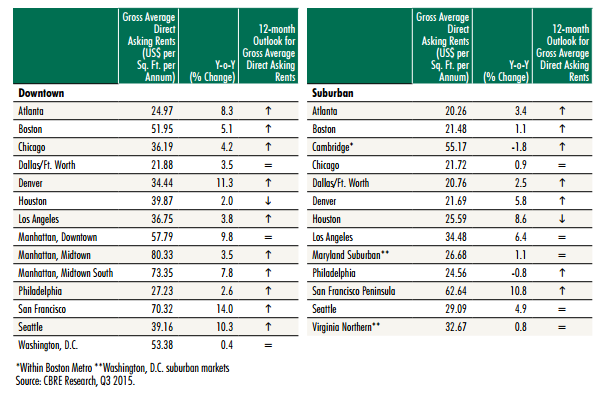 Below is a chart of gross average direct asking rents for the top U.S. downtown and suburban areas. ​See ​Dallas-Fort Worth Market Research, Austin Market Research and Houston Market Research​ for office stats and more!